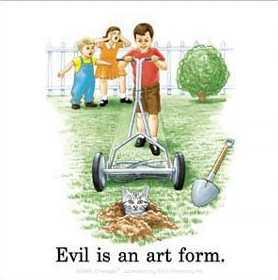 Evil is an art form. And then I noticed the shovel. But seriously, it takes a lot more timing to run over a prairie dog. Deliciously evil timing. That boy is just amateur. do you frequent gardening-supply.co.uk a lot? This is obviously shopped. No real cat would let you bury it and then actually STAY there. What the hell are you talking about? It’s a drawn image not a photo. It’s called Sarcasim. It’s obvious they noticed it was drawn, which makes their comment funny, sorta. Well, it made me smirk at least.